marketing tools in business aviation. Aviation Broadcast is widely recognized as the leading name in the industry. We were the ­first, and we are still the best. Our database is the key to our success. Our advertising clients and subscribers cover a wide range of products, services, and aviation business owners. E-mail Marketing is one of most powerful marketing tools that any aviation company can use to reach their targeted audience immediately. No other type of advertising reaches your buyers in the way that our broadcast advertising can. We have the strongest database in the industry, and over the years, we’ve concentrated our efforts toward building a subscriber base that is interested in your products, services, or aircraft. Within seconds, your message lands in the inbox of aviation professionals, buyers, and sellers…around the globe. 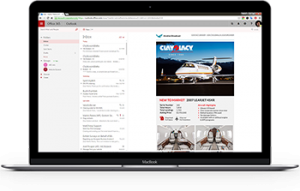 Since our beginning in 2008, Aviation Broadcast has developed and produced thousands of high-quality email ads around the globe and established a client base of over 800 aviation companies and advertisers. Our deliverability rates are among the highest in the industry. Aviation Broadcast was created and is run by people with extensive aviation experience and knowledge. 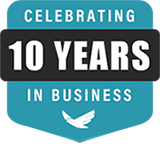 This enables us to fully understand your business and the message our clients are trying to create. Over the years, we have built a database of recipients that are interested in our clients’ products, services, and aircraft. We strive to provide our customers with unparalleled customer service. We build long lasting customer relationships and treat each of customers as if they are our only one. Aviation Broadcast’s email recipients are in more than 90 countries worldwide. While the majority our recipients and advertising clients are in the U.S., we have a significant base of recipients in South and Central America, Canada, UK, Germany, France, UAE, China, and many others. Since 2008, we’ve established relationships with more than 800 satisfied customers and have released thousands of beautifully designed, custom ads to our worldwide list of subscribers! We started using Aviation Broadcast earlier this year after we launched our on-line training courses for FBOs and General Aviation businesses. We couldn´t be more pleased with the level of response that we´ve received so far. Aviation Broadcast will be an important part of our marketing plan from now on! Once I decided to use Aviation Broadcast as my primary marketing tools, my business increased exponentially overnight! They are a delight to work with, and their ability to reach the aircraft owners and flight department managers who are my customers is amazing.